Bring some lush into your wedding with exotic wedding decorations and floral arrangements. Add colour to your wedding theme with the right wedding decors and florals. Change your dreams into reality and solve your wedding qualms with Kiyoh wedding planners. Whether it is an indoor romantic theme or garden wedding or beach wedding, we come up with endless wedding decorations and floral designs that can leave everyone mesmerized. Our backdrops are unique and enchanting to your senses. From bold reds to mild pastels we bring a lot of colour to your wedding theme with decors and floral designs. Our decors standout from the ordinary. 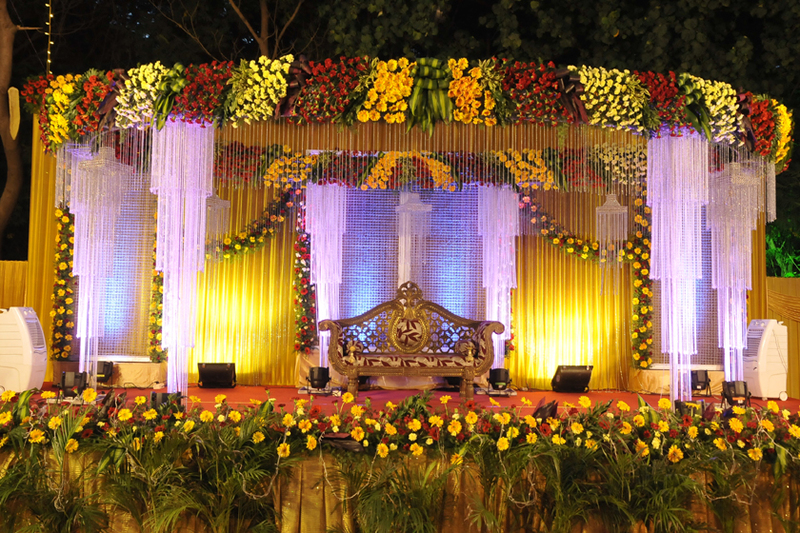 Needless to say, we care for detail and ensure the stage, backdrop, couple seating throne, guest chair arrangements, welcome lounge, dining arrangements all look exquisite and become the talk of the town. Kiyoh wedding planners in Chennai offers superior wedding decoration services with a personalised touch for a perfect fairy tale wedding. Say it with lights. If flowers and decors are not sufficient, we can add lights to give you the magical touch. Whether you want real flowers or artificial ones, we can bring anything to your destination to make your decors complement with the wedding theme. Treat the wedding venue with soft lighting to match your colour theme. Your wedding is no ordinary occasion, and we can match your expectations as all our products are rigorously tested and you can be sure of zero downtime. What makes our decoration services unique is our single point of contact. Our decorators will work with you to transform your wedding location into a picture perfect wedding. You can track all your wedding activities with just one phone call. While you focus on the next big step in your life, we do all the hard work to make your wedding a grand success.